I have made a pledge this year that I would try to see all of the Oscar nominations before the award show. I love watching the Oscars every year, but I hate that I have hardly ever seen more than one of the movies nominated. It's hard to make a pick when you haven't seen the movies. So this year, I'm going to do my best to see them all before February 24th. So far, I have two down. Last night, I dragged my friend to the theater to see a movie she had never even heard of. What a trooper. Argo is based on the true events surrounding the hostage situation at the US Embassy in Iran in 1979-1981. Six US citizens escaped the embassy and found refuge at the Canadian Embassy. To avoid the Iranian Revolutionaries finding the Americans in hiding, CIA agent Tony Mendes came up with a plan to sneak them out that involved faking a Hollywood movie. Wow. This movie had me at the edge of my seat from beginning to finish. There was so much suspense, at some points almost too much, which I don't discredit the film for. It made it an enjoyable movie to watch. I think without that added suspense it would have fallen flat in places. For a story that everyone knows (or should know) the ending to, you have to keep us biting our nails somehow. It had the right amount of violence, which for my taste, is almost none. It was intense, for sure. It was an intense conflict. They captured the intensity perfectly. The moment when the angry mob ambushes the embassy, I had chills. So, so, so many chills. It felt real, without being disturbing. That can be tricky, but they pulled it off. This movie had the right balance of drama and comedy. It was certainly by no means a comedy, but John Goodman and Alan Arkin really brought a lovability to the movie that counteracted all of the sadness. All of the acting was rock solid. They made me laugh, they made me cry, they stole my heart a little bit. And finally, I have to say I'm so disappointed that Ben Affleck was denied the Best Director nomination. I know he won the Golden Globe for it, as well as the Best Film, but I really wish his name was up for the Oscar. Everything in this film was spot on. The design, the music, the acting, the location, the way they recreated Iran of 1980, it was damn impressive. He was robbed. Last note. I just have to say, I love when film or literature shines a light on an event in our history that few people really know about. 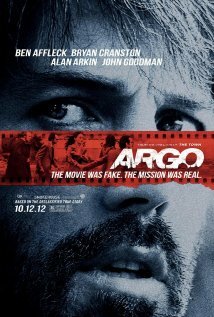 I knew about the Iranian hostage conflict, but I never knew about Argo. On top of that, I loved how this movie explained the situation between Iran and the U.S. so even if you knew nothing, you could keep up. And if you only knew a little, you could really gather an understanding of what it was all about. It makes you think about the conflict in the Middle East a little differently. I agree with you 100% on the violence. I know it can be important in movies like Argo and Zero Dark Thirty, but I have a hard time watching them. I appreciated the way Argo was filmed too. I never have a chance to watch many movies but I try and make a point to see a few of the Oscar nominees throughout the year. Argo is my typical kind of movie, mostly because of the suspense and violence, I do think that Ben Affleck is a wonderful actor and director. I'll have to see it when it hits dvd! I hear the movie is really good. I'm also trying to see all the nominated movies before the 24th! Definitely need to see this and I often have the same goal of watching all of the Oscar nominees. I remember watching one Oscar show and realizing I had no idea what these movies were that kept being recommended. Thanks for the review, I was wondering how it was! I am also trying to see the Oscar nominated films. So far, I have seen Les Mis, Silver Linings Playbook (review tomorrow), Zero Dark Thirty (review on Wednesday). I really want to see Argo, Amour, and The Impossible. Yay for the Oscars! We're they predicting, at the Golden Globes, that they thought Ben Afflect would get snubbed at the Oscars? I need to watch this one for sure. I have been wanting to see this for months, and now I want to see it even more! And I think that's a great idea to see all the nominees. I think I've only seen Les Mis. Also, your new layout is so pretty! This movie has been on our must-see list since we saw the first preview almost a year ago. For some reason grown-up movies don't get watched a lot at our house this time of year. Thanks for the recommendation! I found your lovely blog via the hop...I'm excited to be following along. Especially as a wannabe vegetarian who has yet to pull the trigger and needs all the motivation I can get (like yum recipes! ).